In the recent years designers have started to examine the process of learning in relation to spatial qualities of a classroom. Research and application of non-traditional education spaces has revealed significant change in user behavior and overall teaching approaches. At arki_lab, we started to test out alternative spaces for education through creating outdoor classrooms in collaboration with students and teachers. One of our latest projects, Hans Tavsens Park, served as testing grounds for rethinking educational spaces. Creating new urban spaces is as much about proposing a new user culture as it is about good design. Successful design, without collaboration with end-users, is capable of encouraging certain user behavior through spatial elements. However plenty of desolated and unused urban spaces indicate that there’s still a lack in including the end-users in the design process. Citizen involvement and participation make it possible for local knowledge and experience to be taken into account during the design and build process. At the same time it gives the users a sense of ownership over the new spaces, making it more likely to succeed after being built. This becomes particularly important when experimenting with alternative use of spases as we did in our recently finished project with three classes from the district Nørrebro in Copenhagen. We explored possible ways of creating outdoor learning environments in Hans Tavsens Park. Outdoor education challenges the traditional way of classroom teaching in various ways. In Nørrebro we investigated different ways spatial design might support outdoor education, examining the relationship between design and education: What kind of boundaries are necessary to establish an outdoor “classroom” and which artifacts might be useful in a teaching situation with a lot of unknown external factors such as weather, traffic and other distractions? One significant finding during our project was that when people were asked to imagine an outdoor teaching situation in most cases they simply reiterated the traditional classroom setup with blackboard, chairs and tables, simply moving the furniture outside. This illustrates that spatial design constitutes for more than just building a new construct but it absolutely has to engage the users in order to create a new culture of use together. In this case it isn’t only the teachers and students who have to learn how to do adapt to outdoor classes. It also poses a challenge for the school’s administrative staff and lawmakers, putting the designers in a unique position. In the process of designing urban spaces, for outdoor education, we must work both as designers and researchers, striving to create the necessary connections and relationships among the different stakeholders. The project in Hans Tavsens Park proves that changing the culture of use through spatial design is possible. The teachers were inspired to include more outdoor classes in their curriculum, while the students started reflecting on how this new space could enhance their learning process. Architects from SLA, who are in charge of the renovation in Hans Tavsens Park, were invited to take part in our project. Inspired by our end-user oriented design process, they incorporated possible outdoor education spaces in their design. One of the most critical and difficult parts about designing with citizens is the utilization of collected data from end-users. Plenty of the local knowledge and ideas get lost in translation during the final design process. We, at arki_lab, serve a mediators ensuring that the core values of citizens ideas are always central to the design and build process. There’s plenty to learn from exploring new ways of outdoor education. Studies show that students have an easier time remembering what they’ve learned, when they’re provided with multiple learning methods. Outdoor classes might also help with the lack of space and overpopulation in city center schools. Furthermore exploring outdoor education options opens further conversations about the overall education system and what learning/teaching should value. The fact that people have such a difficult time imagining a non-traditional classroom setting points out that alternative learning spaces won’t easily become the status quo. Yet it necessary for educational space design to adapt and change over time. One thing we think as paramount to education is the ability to take an active part in the community. Successfully designed outdoor education has the prospect to do just that. Flexible boundaries and adaptable spaces create an increased responsibility in students for their own learning, all the while being adjustable for future uses yet to be discovered. 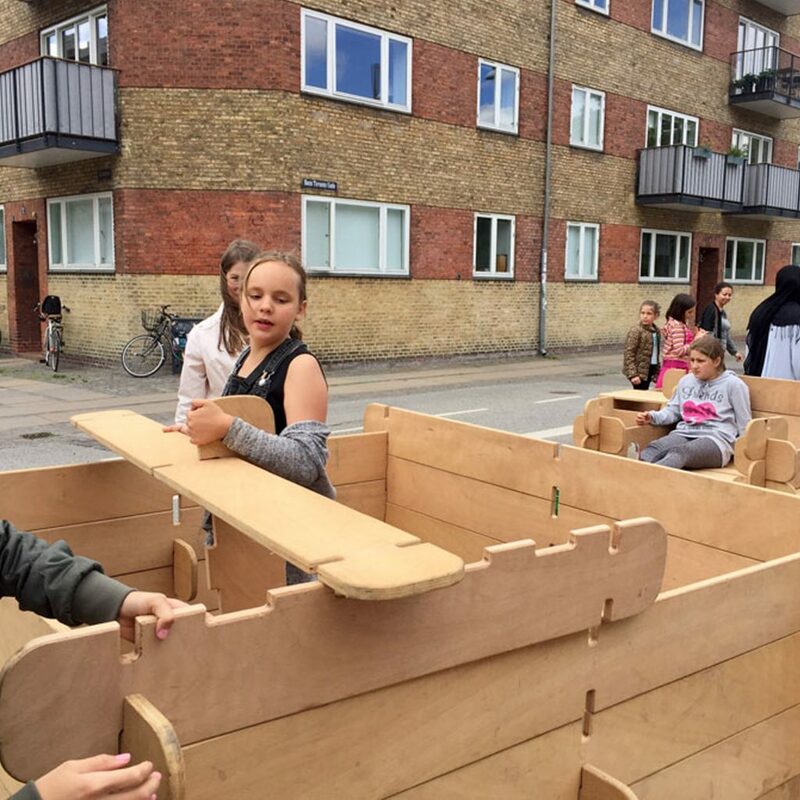 We collected our outdoor classroom design workshops in Blågård school and Nørrebro Park School in a short video. The collaborative process with students and teachers in Nørrebro influenced the Hans Tavsens Park project, aiming to involve end-user ideas and visions. Udeskole i Københavns Kommune from Julie Blicher Trojaborg on Vimeo.